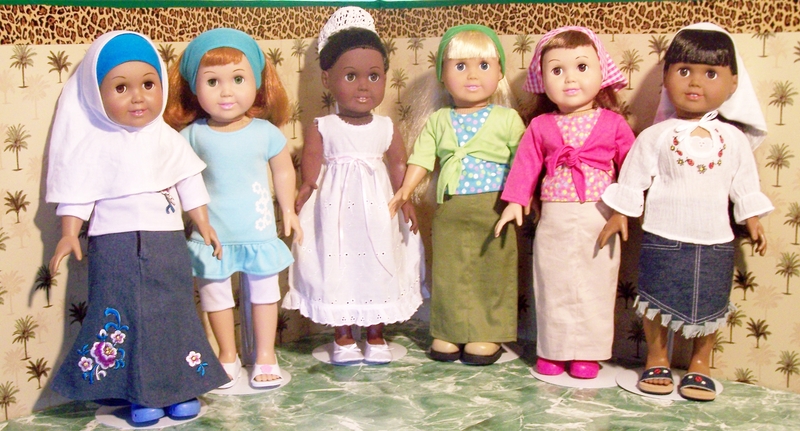 I am a Christian woman and I wear a headcovering, so of course my dolls wear them too. 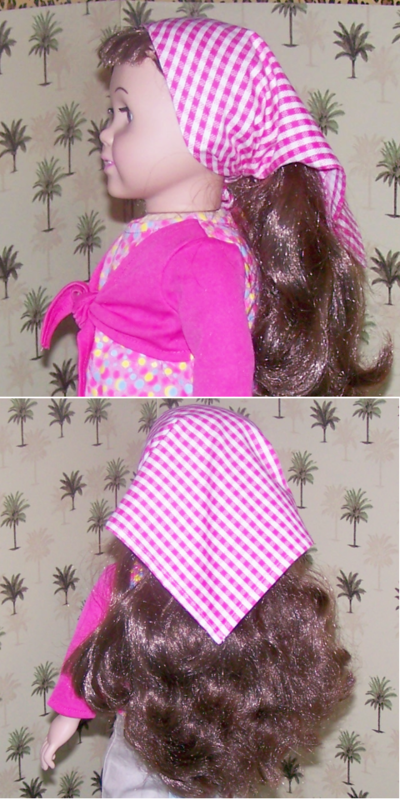 Several years ago a few moms asked me if I had any ideas for easy headcoverings for their daughter’s 18-inch dolls and this post is the fruit of my labor. In the picture above you’ll see half a dozen Springfield Craft Dolls each wearing a different type of headcovering. 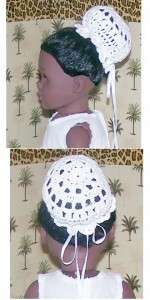 They range from simple headbands to long veils to lacy bun covers. Some of them are no-sew. Some require a bit of stitching. We’ll start on the left. 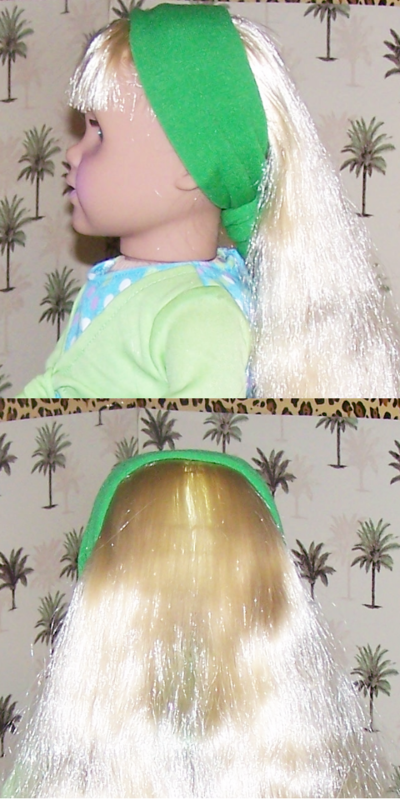 You can see Maria wearing a hijab style headcovering over a blue headband (similar to the green one on Abby, the blond doll). 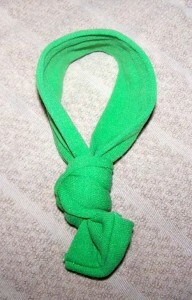 The headband is really easy to make; you can see the method below. The white hijab is made from stretchy t-shirt fabric. I used an old white undershirt (that my youngest son had outgrown) for the fabric and then sewed it with a zig-zag stitch on my sewing machine. You must use a stretchy fabric for this pattern or it won’t fit the doll’s head properly. Now, in case you are wondering why I offer a pattern for a Muslim style headcovering, you may trust that I have a very good reason. In all of the testimony I’ve heard from formerly Muslim women who have converted to Christianity, there is one motivation they all share over and over again. One of the biggest reasons they converted to Christianity is because of the warmth, kindness and forgiveness that they experienced from other Christian women. As a Christian woman, this really affected my perception of myself. I realized that part of my duty as a Christian is to be kind and loving to others, and to teach my children and grandchildren to do the same. So, as a Christian woman, I have taken it upon myself to always be kind to the Muslim women I see in the supermarket and about town. I treat them the way I would like to be treated, with kindness and respect. Because it’s the right thing to do. In my understanding of the bible, hostility and a cold shoulder do not serve God’s purpose. Love and kindness do. I realize that there are lots of political and tragic events between Muslims and Christians in the International scene. I am not in charge of that stuff. Besides praying for peace, there is little I can do to affect it one way or the other. I have not been called to the missionary field in other countries. However I believe we can all do our part for His Purpose. For me this means being kind other women, regardless of their religious affiliations. This is how I serve God to the best of my ability in my own small, humble way. Don’t worry ;-). You don’t have to agree with me to use the patterns and ideas found on this page. Enough preaching and on to the next headcovering. Olivia, the red haired doll, is wearing a Springfield Dolls brand scarf, simply wrapped around her head and tied in the back. It’s an easy, no-fuss way to wear a headcovering, and it doesn’t stand out as odd, which is especially important for headcovering beginners and children. Madison Wearing a Bun-Cover Headcovering. Next we have Madison. She is wearing a bun-cover made from a lace doily. This is a medium-sized lace doily. You can find them at Dollar Stores and Department Stores. They cost $1 or $2. All you do is get a length of narrow ribbon and a safety-pin. I start off with a yard of ribbon and trim it as necessary. Place the safety pin in one side of the ribbon and then weave it in and out of the holes around the outer edge of the doily. Draw up the ribbon to tighten it around a bun. Trim the ribbon so it’s not too long, but still long enough to be tied easily. This can be worn by people and dolls. On Madison it looks a little like a lace mob cap. On a person it looks like a bun covering. Quick, easy, no-sew. A kid can easily make this themselves. 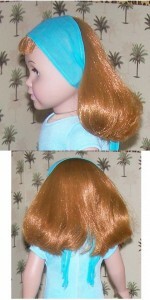 Side and Back View of Abby’s Headband. Tie a knot on one end so it will be short enough to fit around a doll’s head. Abby is wearing a very simple headband. It’s another no-sew idea. This is simply a regular people headband, with a knot tied in it. The knot is centered at the lower back of the doll’s head, underneath her hair. Some women who cover do not consider a headband to be an actual headcovering. I’m of the opinion that when we begin to wear a covering we need a lot of grace. There have been times in my life that this was the best I could do. Also, girls, especially if they attend public school, may need a headcovering that doesn’t stand out too much. I believe that under such circumstances a headband can be a perfectly legitimate alternative. Emma Wearing a Bandana Style Headcovering. Emma’s headcovering is similar to the bandana worn by many who cover. To make it I cut out a 12 or 13-inch square of fabric and then hemmed the edges. If you don’t sew you could use hem tape or iron-on glue to hem the ends. You could also cut the square out with pinking shears (the kind that cut a zig-zag line) and, assuming you used a tightly woven fabric, the edges wouldn’t fray too much and will still look tidy. To wear the headcovering you simply fold it half, making a triangle, wrap it around the doll’s head and tie it under the hair, at the back of the doll’s neck. I used a pink printed gingham for Emma’s covering and folded all of the edges of the square under before hemming in place with a straight stitch on my sewing machine. You’ll notice that the part that goes around the doll’s face is somewhat stretchy because this is the bias of the fabric. If you make headcoverings for yourself or your daughters please note that they fit better and hang more neatly if the bias of the fabric is the part that wraps around your face. 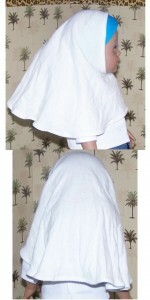 This is what makes bandanas so easy to wear. Gina Wearing a Kerchief Headcovering. 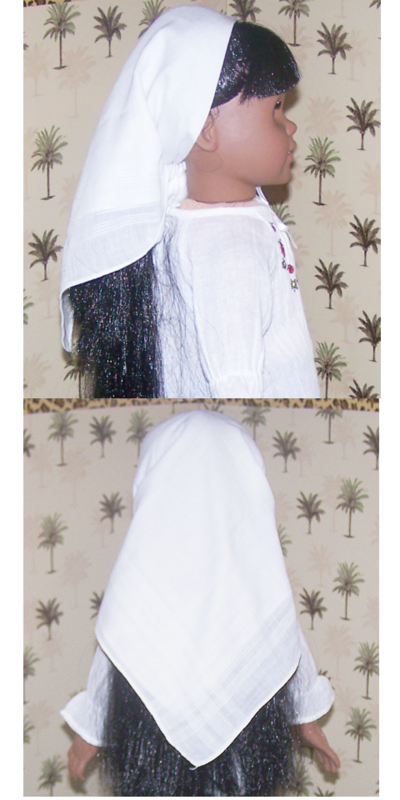 Side and Back View of the Kerchief Headcovering. Lastly, Gina, a discontinued doll, is wearing a cotton handkerchief as her headcovering. White cotton handkerchiefs make great coverings for little girls and for dolls too. They can found very affordably at Dollar Stores. Dollar General and Family Dollar both have 3-packs for about $2. Sometimes you can find very pretty handkerchiefs at Thrift Stores and yard sales. I always keep an eye out for them. To wear the covering I simply folded the handkerchief in half, wrapped it around Gina’s head and tied it under her hair, at the back of her neck. It’s very pretty and I admit, probably my favorite of the entire collection. Very inspiring post. I have recently felt lead to dispose of the regular Barbie dolls and replace them with flat-footed Skipper dolls as well as look into making clothing for them that are closer to the way I dress my daughters. 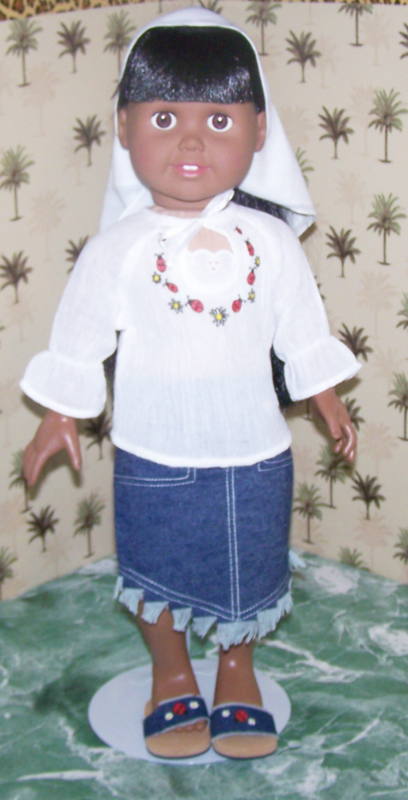 Some of the doll clothes are far too revealing and I realize that a doll can’t honor God but my daughters can play in a way that is honorable to Him. Hi Felicia, I can identify completely with what you are saying. I have a long-time, on-going problem with Barbie. She is way more adult-looking than I want my daughters (who are both grown) or my grand daughters to play with. Skipper is a great alternative. If you do a Google search for “Free Blythe Doll Patterns” you’ll get a lot of free patterns online that fit 9 or 10-inch Skipper dolls perfectly. Most of them are simply copies of older Skipper Patterns from the late 1960’s that were produced by McCalls Patterns. 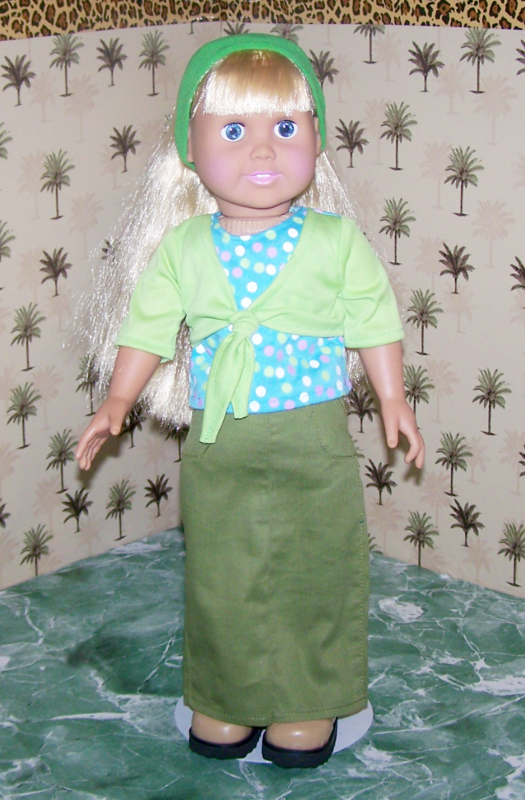 Blythe and Classic Skipper doll clothes and patterns are interchangeable. 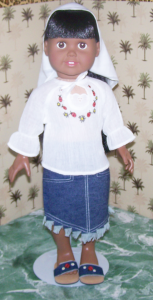 There used to be a very good quality Christian Fashion Doll called Faith & Friends, produced by Mission City Press. They were fashionable, but far more modest than most commercially available doll clothes. Sadly they have gone out of business now. But you can sometimes find them on Ebay very reasonably. They are 14-inches tall and shaped like little girls. There aren’t too many patterns that fit them but if you look for *Slender 14-inch doll patterns* or *14-inch Besty Mcall* patterns you can find them. *Hearts for Hearts* dolls are similarly sized and easy to buy online. As far as I know, they are the best alternative to Faith & Friends available today. They are wholesome and come with interesting stories about each doll. I can testify that they are very good quality too. 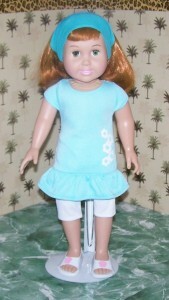 Just for playing and sewing for though, I think flat footed Skipper dolls are probably the best you can find. Plus the ones from the 1990’s are super cheap on ebay and you can still find them at yard sales and stuff. And all the older 1960’s Skipper patterns fit them great. I wear a square of fabric folded in half. I have Christian friends who wear headcoverings similar to the muslim hijab. 🙂 i think its kind of pretty. Thank you fir your testimony. I volunteer with Syrian Muslim refugees and believe it part of my mission is to show them Christian love as abundantly as I can. 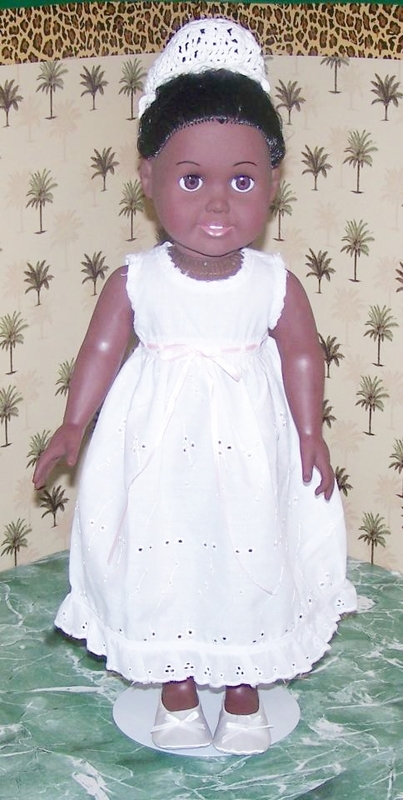 Right now I am looking for a Muslim faceless baby doll or pattern fir make no one. Suggestions?